This Is Getting Old: Rashard Mendenhall a 9/11 "Truther"? 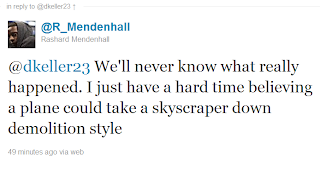 Rashard Mendenhall a 9/11 "Truther"? When not putting the ball on the ground in the biggest game of his life apparently Rashard Mendenhall is an expert in Engineering. Mendenhall put out this nugget of genius the day most Americans were celebrating the death of the man who murdered 3,000 people in one day. And with that Mr. Mendenhall joined the growing list of athletes who should not have Twitter, or, at the very least, should have someone with half a brain Tweeting for them. The person that Mendenhall retweeted is Dominique Keller, a former basketball player at the University of Illinois.